On December 9th to 19th, 2018, we returned to the Hald International Center in Mandal to attend the Infield. The Infields happening when every internationals students from Hald return come back to there for meetings. We are approximately 30 international students in Norway. We returned to the Hald with various expectations and it was very nice to be able to reconnect our friends there. We had some lessons about the book of Genesis and the life of Joseph. One of our Brazilian friends, Lucas Francisconi, taught a lesson about the life of David and his example as a man after the heart of God. It was a very interesting class. One of my biggest expectations about the intership was to finally to see the snow. In Sandnes and Stavanger, unfortunately, it does not usually snow as much as other cities in Norway. I was born and raised in Rio de Janeiro. Rio is an extremely warm city. It is very common to have a temperature above 40 degrees. So, my dream was to see the snow. And that's what happened. When I was still in Brazil, I promised myself that I would throw myself in the snow. Well, I kept that promise and I buried myself in the snow. One of Hald's most memorable nights was when the Interact Program students organized Praise and Prayer. There was a time when we sang the song "How Great Thou Art" in English, Portuguese Malagasy, Nepalese and Swahili at the same time! It was wonderful. This moment reminded me of the biblical text of Acts, chapter 2, on the day of Pentecost. In the last days, we went to Ice Skating at a park in Mandal. I confess that I found it cool, but very dangerous if you're not careful. I tried sometimes to balance myself, but it did not work very well. Anyway, it was a very different experience for me and it was worth trying . Before I forget: I was feeling a lot missing from Hald's food. Yes, I know that Norwegian food may be healthier, but Hald's food is closest to Brazilian food. 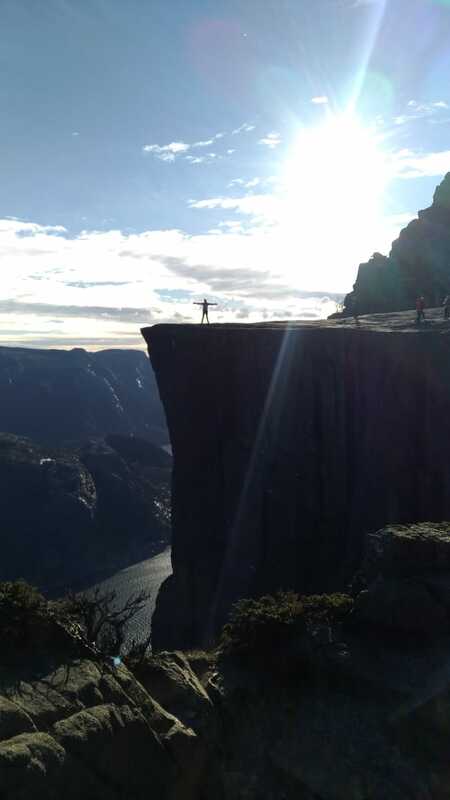 On 29th October, we went to an adventure very nice to Preikestolen. Preikestolen, or Pulpit Rock in English, is a tourist attraction in the municipality of Forsand in Rogaland. It is a steep cliff which rises 604 metros above the Lysefjorden. Atop the cliff, there is an almost flat top of approximately 25 by 25 metros. It sits on the north side of the fjord, opposite the Kjerag plateau, located on the south side. We live in Sandnes, which is 45 km far from there. We should not come back to Brazil before to go there. Right, we done it! We woke up early on the morning to prepare ours stuff: appropriate clothes, snacks, coffee and, of course, smartphone with full battery to take some pictures. Our dear host mother Ariane joined us with her baby Helena. The day was perfect to do it: clear sky, sunny day, not too cold nor raining (uncommon day in Stavanger Region). Our hiking to Preikestolen started around 11 am and just in few minutes we could see amazing places and views. We walked about 2 hours to arrive the up there and when we got there we were impressed. The sky was totality clear up there and we could see clearly whole of the landscape. It was really fantastic. My first thought was how high we were and how dangerous could be it, but all those thoughts went away when I see how amazing the view was. Bit by bit I approached to edge of the cliff, it was very windy, and when I got the edge I spent some minutes appreciating the view. Actually, I do not remember about what I was thinking, but for sure I thought in some moment how great God is and how He is uncovered through His creation. I believe the day in Preikestolen was one of day most incredible in Norway. I am very thankful to God for that moment and for beautiful nature which He made. After two months working with Laget in Stavanger, we were challenged to teach something at ACTA Bibelskole. ACTA is a biblical school from IMI Kirken in Stavanger. In the beginning, we felt scared because it would be the first time that we would teach in English and in an important school as ATCA. However, we knew that God would be with us and He would help us with everything at ACTA. We had thought to teach about the method of inductive bible study because we use it a lot in ABUB (student movement affiliated with IFES in Brazil) and after to think about it, we agreed to teach about it at ACTA. Then, we start the preparation to class. The main challenge in the work before the class was to translate to English all of resources that we have about inductive bible study. We used as main reference, the book “O Estudo Biblico Indutivo” by Antonia Leonora van der Meer. The book has been used by students in Brazil to learn how they can make and lead an inductive bible study at University and high school throughout Brazil. On the day of class, we arrived at ACTA 30 min before class to join the students in a devotional time. We sang some songs and prayed for few minutes. The devotional time was good, ACTA students are very intense in their spiritual lives, especially when it comes to worship, at least that was my impressions. After the devotional time, we started the class. The students were from different countries of World. There were students from Philippines, Kenya, Chile, Serbia… Well, those are the ones I can remember. I really like that kind of culture mixture and I think it helped a lot the discussions in the class. The class had three parts of 45 minutes. The first part we introduced ourselves to students and we told a little bit about ABUB and our work with ABUB. We also presented the concept of inductive bible study and a bit about the theoretical part of it. The theoretical part, although to be a bit boring, was very good because the students were really engaged in the class and asked us many questions about it. The second part, we simulated an inductive bible study at university with them. We made a circle with the chairs, then I leaded a bible study. For me, it was my favorite part because I spoke very less. I was very happy because it is exactly how should be an inductive bible study: all of people contributing in the study. The students were very well in the second part. Finally, in the last part, we proposed the students to make a study using the inductive method. We choose a bible text and they made a study from it. The experience at ACTA was amazing for me. I could see that I have improving a lot my English and now I am using it as a work tool. I also got very happy for taught the method inductive bible study because it is the main tool that we use in ABUB and I could share it with other students in Norway. One of my jobs at Laget is to apply devotionals in high schools in Sandnes and Stavanger. Our devotionals, in this case, are a lil bit different. The Devotionals are made in an interview model. Sigvart Smith Eide and I developed a very interesting method: we invited the students to sit in a half-circle and we began the interview by reading a Bible verse. And we ended the interview with another Bible verse. The interview and the questions are based on my life history and the violent daily life of the favelas of Rio de Janeiro. Yes, I am from Rio de Janeiro and live there. Let me explain: The Favela is a kind of poor community. Rio is divided in a rick part and a poor part with a lot of distance between each other. There are many Favelas and I live in one of them. In the Favela, we don’t have a clean water, security, or safe houses. In this part of city, we don’t have a good schools or good hospitals. Our houses are very small. And it’s a violent place. It’s common that there are a many criminality groups in the Favela, fighting for controlling the traffic of drugs. The favela is like a State inside the official State. Its look alike one place without institutional law but we have a many unwritten, unofficial law inside the favela. It’s gonna be dangerous to drive or walk there if you are foreign or if you we don’t live there. We believe it is very important to make this interview dynamic because, in this way, we bring a different perspective of what it is to be a Christian in a context of violence, insecurity, where the state cannot solve the problems of society. Where people are treated by the state in a different way, where the laws benefit the rich more than the poor, where black people do not have the same treatments as white people. In these interviews, we talk about how important it is for the church of Christ to make a difference in these spaces. In a context of violence and social and economic vulnerability, the church must act to preach the gospel of Christ and promote a social welfare for the people. In this context, the people don’t become a Christian just because it’s cool or fancy. It’s not about to have a philosophy to believe. It’s not just to go to the church because you can make some friends and hang out. It’s not about to be a good person and make a some kindness. The real reason for becoming a Christian is because just Christ have a new perspective for your life. Only Jesus Christ can save you and give opportunities for survive. In Brazil, social and economic vulnerability causes people to have problems with chemical dependence and alcoholism. Many children grow up without parents or many of them often see their mothers being victims of domestic violence. Many young people become involved in crime and drug trafficking and end up dying in conflicts between criminal factions and the police. If you live in a favela in Rio de Janeiro, you can wake up with a bullet in your window or on your wall. In the favelas, unfortunately, it is not possible to trust the police, the state, or the criminal groups. In the favelas of Brazil, it is only possible to believe in Christ to survive. The Church of the Nazarene in Morro da Babilônia. It is one of a many favelas in Rio de Janeiro. This community is close to Copacabana. On 29th September 2018 we arrived in Sandnes. We were a little anxious about the question of what it would be like to live in a Host Family for 6 months. For me, in the beginning it was a challenge to learn to get used to the idea of living with a host family an other country. Despite the apprehension of the unknown, we were very well received by the Caixeta Thingnaes family. We have two gorgeous little host sisters and a dog brother. As soon as we got home, we were alerted by our host mother: "Look, here at home is a mix of languages. We speak Portuguese, English and Norwegian at same time and sometimes we just switch the languages. So, you get used to this mix of languages." Let me explain: our host mother is Brazilian, and she worked for a long time at Laget of Brazil. Having a Brazilian host mother makes all the difference because it's like we're at home in Brazil. But at the same time, it's funny because our host mother is more norwegian than brazilian. In fact, she was totally absorbed by the Norwegian culture. One of the funniest things to note is that our host father also speaks Portuguese and occasionally tries to make some jokes that make sense in English but that in Portuguese there is no sense at all. Our 3-year-old little host sister understands well when her mother speaks Portuguese with her, but she answers in Norwegian. She used to talk to us in Norwegian, but unfortunately, we still do not understand everything what she says. A few weeks ago, I was letting my beard grow, but my host sister called me Santa Klaus. Then I understood that it was time to shave. We also have another little sister sister of 8 months and they love us with their sense of humor. There is no bad time for her because everything we do for her is fine. Her smile lights up our family. And it's amazing to know one thing: she eats everything her parents put on the table. And we have a dog brother. His name is Aslan. We call it vacuum cleaner because he usually eats all the food that our host sisters drop on the floor after dinner. We are like so much to working at the University of Stavanger with Laget and applying devotionals in High Schools. We are in a wonderful environment so that we can do consistent work in Sandnes and Stavanger. We have a fantastic family and a small team but very good team to work. In fact, our host norwegian-brazilian family is the best part of intership. We arrived in Stavanger/Sandnes on the begging of October. Here, we live with a family in Sandnes but the Laget Office is in Stavanger. The Laget Office is in the NMS Building and it is very nice to make network with the staff workers from NMS. Usually, we have a staff meeting once a week at Laget Office. Those meetings have been very important to build a team strong and which work well together. Our team is not big, I think it is very small for a region so big as Rogaland. However, we trust God and we know that all is in His control. Here, our main work has been visiting the Laget group at University of Stavanger and groups at High Schools. It has been very nice at UiS and our plan to January is to start a study bible group in English weekly at UiS. About Stavanger, I could identify it is a city with many immigrants. When I walk on streets I can hear different languages and I can see different type of people as well. This kind of environment is very nice, and I feel very well here. Sandnes is not so different from Stavanger. It is a city a bit smaller, but it is very cozy. I usually say that I prefer Stavanger at evening and Sandnes at morning and afternoon.